New Year’s Eve is Angel Baby’s birthday. Since we were having cupcakes at the party the following day, it never occurred to me to make her a cake on her actual birthday until about noon on the day of. WHOOPSIES!!! There’s a Dollar General about a mile from my house. Yeah, I have other swell geographical references nearby too. You might be in South Carolina if you tell people where you live by saying you’re between the flea markets on the road that’s across from the Dollar General. I take new people in from the other direction. It’s way more fancier. Anyway, I ran up to the Dollar General to see what they had to work with and came home with 2 sleeves of baby Butterfingers, a cake mix, some sundae syrup and a can of frosting. A little while later, this is what we had to show for it. This was super easy and the onions thought I was a total rock star for this one. Prepare cake mix per manufacturer’s instructions for 2 round pans (8 or 9-inch will work). Cool cakes in pans. Place one cake, top-side up, on a serving plate. Pierce cake about 10-12 times with a fork. 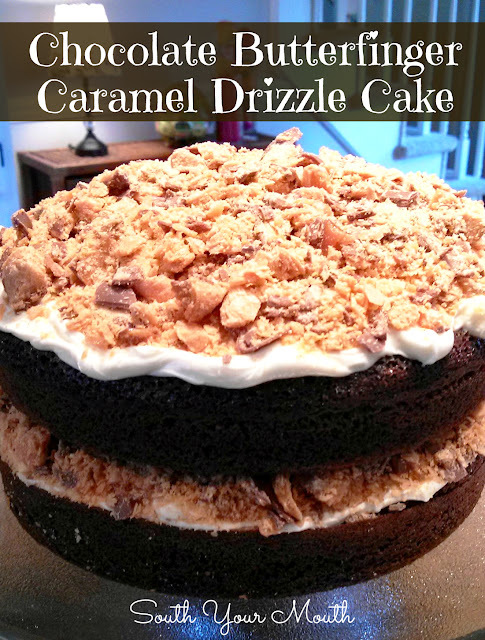 Drizzle half of the butterscotch syrup over the cake. Most of it will be absorbed by the cake but it’s A-OK if some of it drips over the side. Frost the top side of the cake with half of the frosting and sprinkle with half of the chopped Butterfingers. Place the second cake on top of the first (top-side up) and repeat the same steps with the remaining butterscotch syrup, frosting and chopped Butterfingers.